Nokia Wellness Diary - Get a healthier lifestyle! 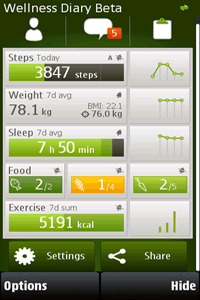 Wellness Diary helps you to build healthy habits into your daily routine in many areas – diet, exercise, sleep, stress etc. Tracking your progress is simple and proven to be highly effective.